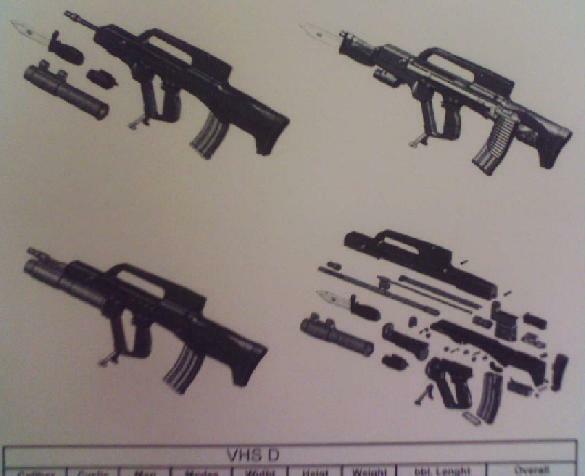 A big thanks to Streinger, the person who has posted on the Web pictures and infos of the Croatian VHS assault rifle: http://www.ghostrecon.net/forums/lofiversion/index.php/t26318.html Today he sent me pictures of exploded view. Pictures made by Streinger This new Croatian rifle, named VHS, was recently presented on iKA, an annual innovation display in Karlovac, Croatia. Externally, it may look like a fuse of Tavor, Tavor 2 and FAMAS, but internally, there's a different story; when fired, gun powder gasses push the bolt backward via piston, that much is the same as in almost all assault rifles. However, the unique feature of this gun is that it has additional gas vent that leads some of the gases into a chamber located BEHIND the bolt. As the bolt moves backward, it's gradually slowed down and then softly stopped by a gas cushion, rather then coming into an abrupt stop as it reaches it's most backward position, causing recoil. This feature makes VHS, well, not recoilless, but very low recoil and easy to fire. 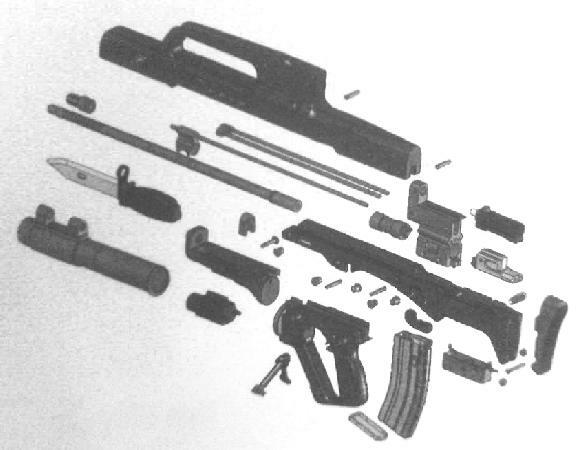 Some other features of the VHS rifle are the following; length 750mm, width 448mm, height 255mm. Barrel length 500mm(!) Calibre 5,56X45mm NATO Cyclic rate of fire- 600rpm, single/auto/safe fire selector Weight (without flash light, grenade launcher, bayonet or magazine)- only 2,3kg(!) Pistol grip placed in weapon's center point, making it possible to fire with one hand. Integral bipod that folds entirely into a serration in the grip. Dove tail mount located under the barrel, infront of the pistol grip- for mounting flash light, laser or IC light. 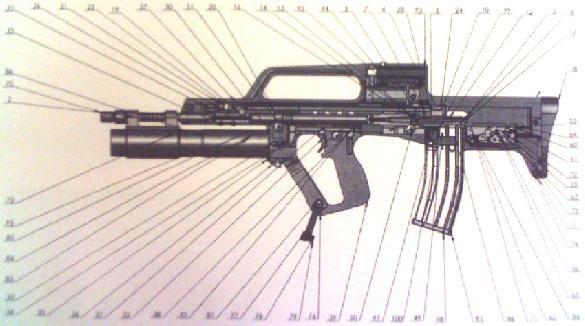 Easy mounting 40mm underbarrel grenade launcher- when lower part of the front grip is removed, the GL mounts on the gun in the same manner as the bayonet. Any kind of optical sight can be mounted ontop of a carry handle, which is also equipped with iron sight that shooter uses with both eyes open- apparently, this feature is common in some hunting rifles...I'd appreciate any additional info on that. (I'm familiar with military rifles, but know next to nothing about hunting rifles or shotguns...) The VHS is developed by HS Produkt, the same factory that makes HS2000/ Springfield XD pistols. It's been thoroughly tested by HS Product team and presented as finished product, not prototype. It's currently undergoing testing by Croatian army. Rumour has it it's even been offered to US army... Possible date of adaptation by Croatian army- some say Croatian contingent of MPs in Afghanistan will be equipped with VHS soon, other sources say the earliest VHS can be adopted is 2008... Other link: New assault rifle that has been developed for the past few years by company "HS Produkt" was yesterday (Apr 16, 2005) shown to the public for the first time. By the words of Ivana Zabcica and Marka Vukovica, the owners of the company, after the HS2000 pistol witch was pronounced the best pistol in U.S.A. the new assault rifle should bring new standards to the world arms market. The rifle has a new construction and in comparison to the simmular weapons it will have the longest barell length, lowest weight and be easy to dissemble. Other easily put add on´s will include a grenade launcher, knife and laser. The gun (5.56mm) will be offerd with a new aiming construction witch is used with both eyes. The gun is in testing faze but contract for deliviry to croatian army is expected to be made soon. Part of the rifles will be tested in croatia and part in real combat conditions by croatian military police stationed in Afganistan.